Spent some time yesterday redesigning the top of the roof and rebuilding the base so that the track fits properly. I'm not in any hurry and when I do finish it, I'll have to do something about sorting out a layout for it to go on. I seem to be continually re-cutting bits of card to get everything to fit, but I suppose that's what comes of trying to build something without any plans or dimensions to hand. I also just found out that although the parts I drew in LibreOffice Draw easily fit on a piece of A4 paper, the software had decided to shrink some of the drawings slightly on printing, so the shed isn't actually 250mm long it's 244mm long. I only found out when I printed some drawing on a another printer that was set to 'crop (preserve dimensions)', but it's all a bit of a learning process I suppose. You're making a nice job of it, Ed. Lots of errors, but if you don't try you don't learn. At least a loco fits. 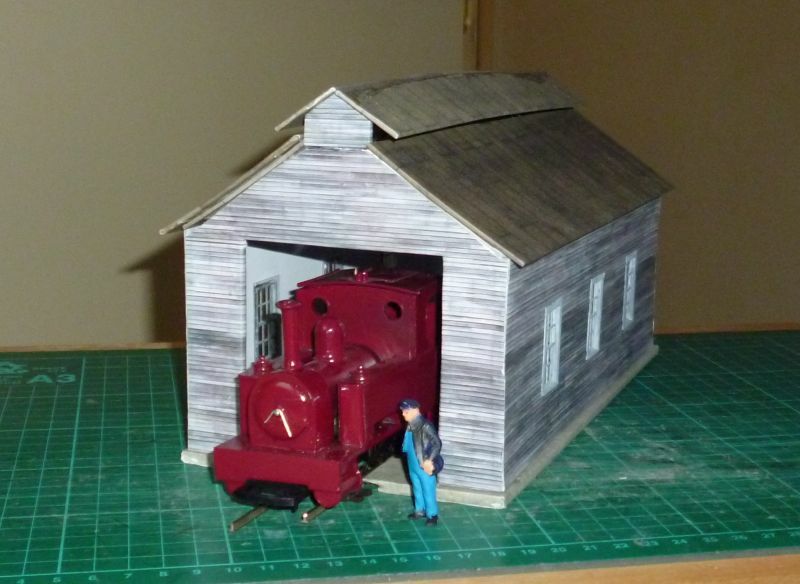 Nice loco shed. I'm following your topic with a great interest. I've actually decided that the surfaces look too flat in this scale. It would probably be ok if it was right at the back of a large layout, but it sits right at the front of my narrow plank. So, I have today received some Slaters embossed plastikard to try and give it a makeover over Christmas. 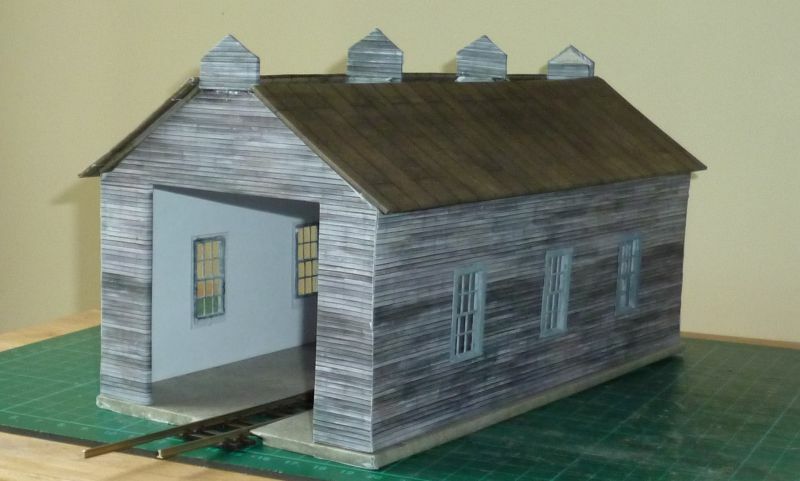 Shiplap would be about 6" on the real thing and so would be a good 3 1/2mm on the model. 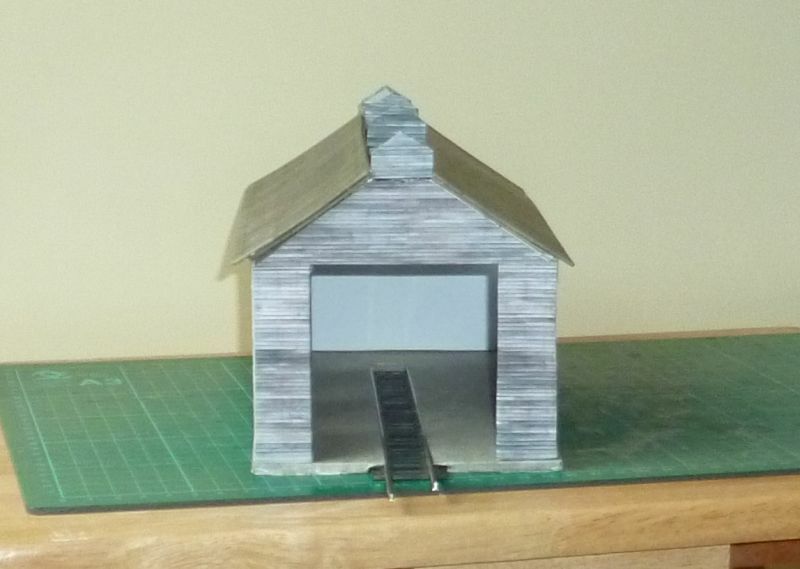 Strips of card overlapping are fine, but I've done shiplap buildings using Foamex and impressing the overlap. Cut lines just below the surface, then with the end of a steel rule or similar instrument angle over a bit and draw down the plank so that the edge is tucked in at the cut. Bingo, shiplap. So easy. 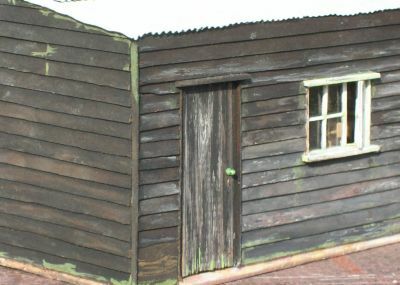 This is 1/32nd scale for a NG layout I once started called Raveloe, but I gave it to a friend with more space and then he suddenly died and I never saw the models again. But it shows what you can do with Foamex sheet. Any signage company will have large offcuts. Not too keen on that tapered boiler on the Smallbrooke NG black loco. Looks a little out of proportion to me. I think skirts would look great. Not enough tramways around and track on the sides of roads always looks good. 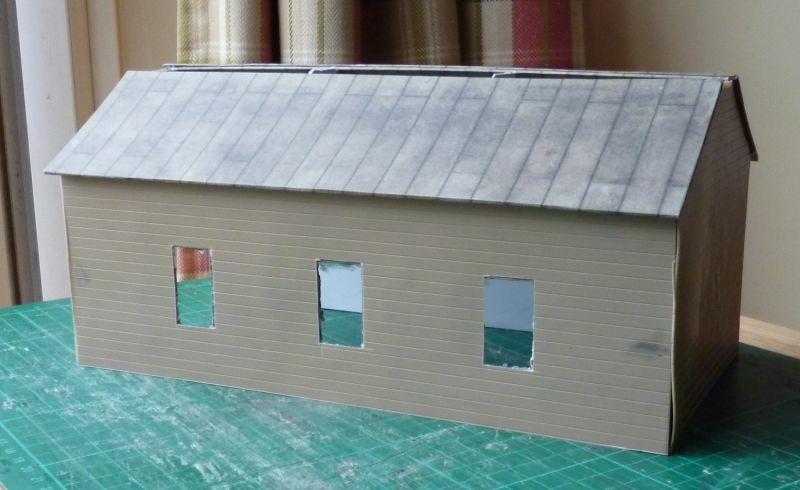 The engine shed is about 244mm long x 1200mm wide Martin, and I decided I didn't have the patience or skill to cut over 20 strips of card for each of the walls to make Shiplap. I don't really want to start all over again in Foamex either, so Plastikard clapboard seemed the easiest solution. As a member of the 7mm NGA I can get it at a reduced price with free postage, so I thought it was worth a try. The Smallbrook black loco (Aura) is really just a cab and a chimney on a Hornby body, so yes it isn't really going to look right, but it's a good introduction. 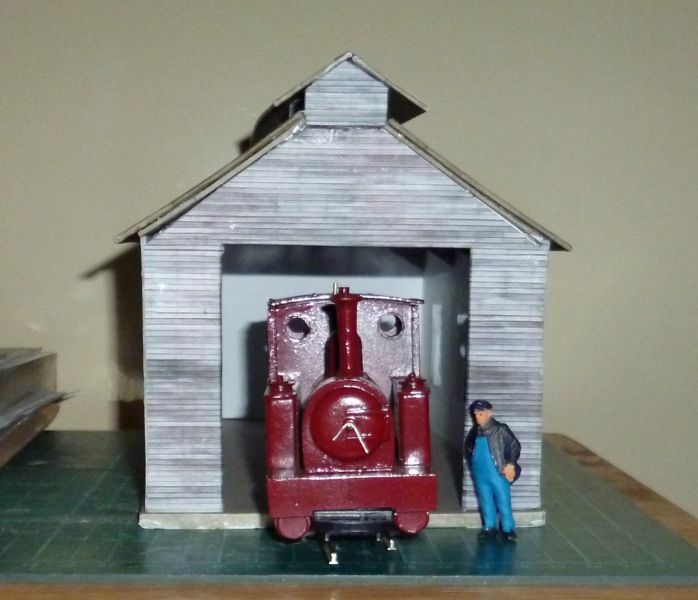 The maroon loco (Echo) is a full body kit and looks much better. Which reminds me, I still have loco No3, another Smallbrook kit to build and I've just bought a Bachmann Porter 0-4-0 which I hope to anglicize. Ed, patience is one thing, but it takes no skill to cut 20 strips of card, really. And it takes no time at all. You could do it while your tea cools down. It will look better than Slaters (slight irregularities) and cost you nothing at all. It'll also take paint better. Stick it on with Evo-Stik from a tube. Don't go looking for it. Shops no longer stock it. I got a pack of 6 tubes off ebay for a tenner. I no longer use shops except for food. I buy everything online as shops are generally a waste of time these days. No stock and couldn't care less, so to Hell with them. I've already got the embossed plastikard so I am going to stick with it, but I have a small hut to build so I might give strips of card a go on that. I take it you have a straight edge, so cutting a strip of card couldn't be easier as long as your knife is sharp. And you aren't cutting 4 walls, you're cutting strips, from which you would be cutting whatever length you need per wall. But if you are about to make a hut, try the Foamex method. Much quicker. 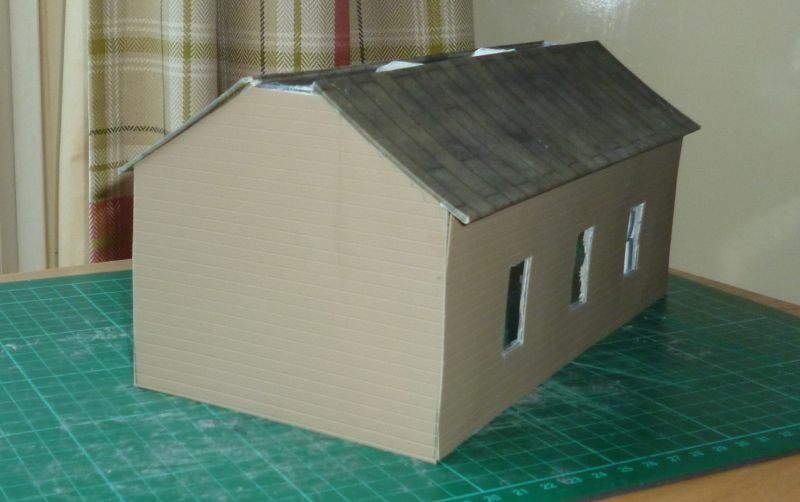 Might give the Foamex a try Martin, when I get some of current kits and buildings finished. The beauty of Foamex, Ed, is that you can do brick, concrete, render, stone and shiplap all at one hit, if you could find such a building! Been having a look and Foamex seems to come in various thicknesses Martin, any preference? Ed, I use 3mm as it's easy to cut and mitre for corners and plenty strong enough. I have it down to 1mm and up to about 8mm, but only use the 3mm normally. I've been covering the shed with Slaters clapboard and for some reason the last wall I've done has become blistered. I've used UHU glue to stick the embossed platikard straight over the paper clad card walls and all the other walls are fine. Not a very good picture, but there's not a lot of light. It's almost like the glue has reacted with the patikard as the whole wall is warped, but all the other walls are fine. You can see the warped back wall in the picture below. Ed, that can only be a little too much UHU, more than the other walls. UHU and Evo-Stik do have solvents which will attack plastics if they're used too much, but a thin skin is all you need. I would personally never use UHU for anything of any area. I just can't get on with it drying too fast. That Plastikard isn't clapboard, it's siding, which is like the sort of wooden walling (usually metal) that Americans use on their walls. Clapboard overlaps, hence the name "shiplap", like the more correctly named "clinker" planking on smaller boats where the plank above overlaps the one below. Of course on a boat the planks are precisely cut in shape and carefully rebated to fit perfectly at the ends. On a shed the planks are just simply overlapped. And that texture shows, in any scale. I'm surprised how thin that sheet looks. 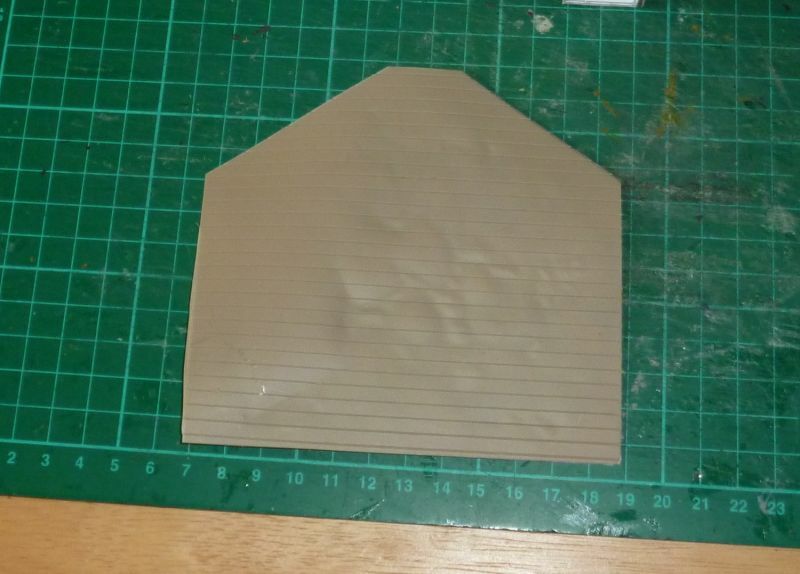 I've been gluing styrene sheets to card for decades and it always works with Evo-Stik, which I put on from a tube quickly and then spread it with my thumb and forefinger...nature's spatulas. Same on the back of the styrene and leave it for a while. Then, with care, bang the two together. The solvents will have evaporated long ago. Your only hope here is to replace it, I'm afraid. Didn't think I'd used more glue on this wall than I did on the others, but perhaps I did.